What’s Cookin’ in the Country? Though we haven’t really had much cold weather yet, I’ve already started with the warm and inviting soups. We love them! 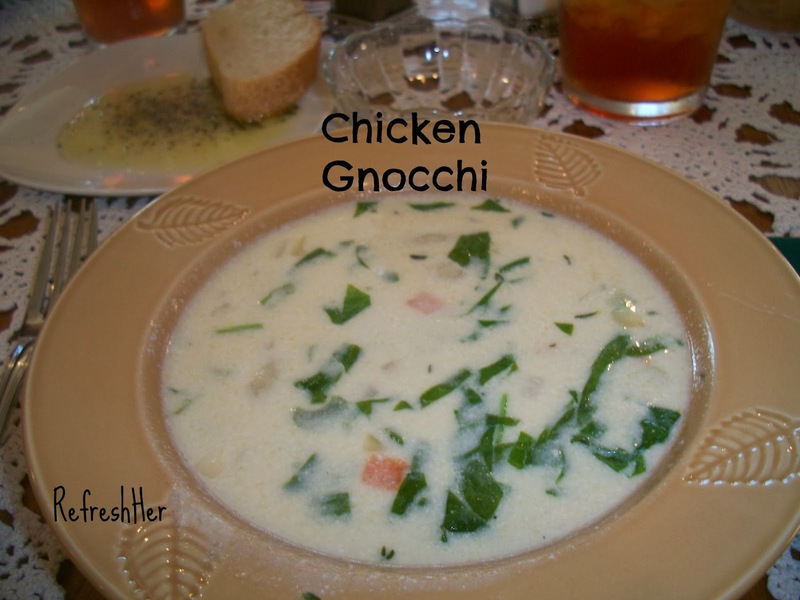 I found a copycat recipe for an Olive Garden Soup on Pinterest – it’s for Chicken Gnocchi. Y.U.M. Gnocchi (is that singular or plural?) is are little potato pastas that are so wonderfully good! You can make your own, or find them where the pasta is sold. This is a really filling soup! Saute the onion, celery, garlic, carrot in oil over medium heat until onion is translucent. Add chicken, chicken stock, half and half, salt and pepper, thyme. Heat to boiling, then add gnocchi. Gently boil for 4 minutes, then turn down to a simmer for 10 minutes. Add spinach and cook for another 1-2 minutes until spinach is wilted. (Heat to boiling and add cornstarch dissolved in 1-2 Tbsp water at this point if you want a thicker soup.). FYI – gnocchi is/are (???) on sale B1G1 at Ingles this week! Bogo? Help me remember that when I get home! I made your recipe for “Katie Brown's Chicken” on Monday, and used the leftovers to make this soup on Tuesday. YUM!! The carcass,with the lemon and rosemary, made a delicious stock. My family loved both meals. Thank you for the great recipes!